Spring in Florida can be a very dry time, and this makes the proper irrigation of your sod all the more important. Dry weather doesn’t last forever, but your diligent watering efforts during this dry season will ensure that your sod stays vibrant and healthy for many, many years to come. Rather than using unreliable guesswork to water your lawn each week, remember these guidelines. First and foremost, be sure to schedule your irrigation at the right time of day. Experts agree that the very best time for lawn irrigation is the early morning hours. This allows your sod to absorb all of the water it needs without losing too much to excessive and rapid evaporation. On the other hand, it’s also important not to water at a time when the water will sit on your grass for too long and smother it with moisture. Expending the “dew period” of your sod will accelerate the development of disease. Stick to early morning to be safe! Watering frequency is just as important as its timing. There is no one simple amount of water that all sod lawns need; it varies not just between location within Florida and time of year but also between the types of sod as well. For this reason, it is best to ask your sod provider what irrigation frequency they recommend. As a frame of reference, St. Augustine grass with six-inch roots can make it up to six days between irrigation events in Miami in the fall, and up to 28 days between irrigation events in Pensacola in the winter. It’s all relative! 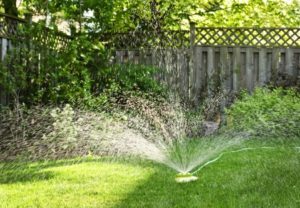 You do not need to adjust how much water you use on your lawn, as long as you adjust the frequency of your watering seasonally. If sod roots are in the top 12 inches of soil, and the soil is dry, then a ½ to ¾ inch of water will be able to wet the sod thoroughly. Too much water will saturate the root system and harm your sod, while too little water will cause it to dry up. Don’t fall into the temptation of using light but frequent watering to “stay safe.” When in doubt, place an empty tuna can on your lawn while your sprinklers run and check the amount of water collected after 30 minutes. This will help you track how much you have irrigated and adjust accordingly. It is always wise to ask for support from your local sod farm to ensure you are using best practices that will keep your sod healthy and green. Council Growers Sod offers decades worth of grower knowledge to help you cultivate a yard you can show off to everybody. Call (813) 633-8665 to learn more.